Words cannot describe the beautiful and almost untouched coastlines in Albania. You can walk across Europe and still come back to Albania for a wonderful beach experience. As you enjoy the silence and tranquility of the beaches, you cannot help but notice two great things other beaches fail to offer; privacy and solitude. It.s as if you are all alone in paradise with nothing to worry about. All you can see around you is but the blue waters and the stretched white sands across the coastline. One wishes the holiday and the vacation would last a lifetime. The Albanian weather tends to vary from north to south as the country lies in latitude. With perfect summer temperatures of up to 24 Celsius (75 Fahrenheit), one can peacefully raft in the waters or just bask along the coastline. Temperatures during winter may be as low as 7 Â°C (45 Â°F) which is perfect for sightseeing. One of the coolest things you cannot fail to notice is the cool Mediterranean weather in the coastal lowland and the pleasant Mediterranean climate of the highlands. This weather characteristics completely alien to top European travel destinations. Nature lovers will definitely fall in love with the rich biological diversity of Albania. The country is rich in both flora and fauna. A third of Albania is forested with over 3000 plant species growing in some of these forests. The forests are home to several mammals like the lynx, wild bears, wolves and foxes as well as the rare wildcat. Different bird species also inhabit the forests. A good example of such birds is the golden eagle which is Albania.s national symbol. There are several car rental services in Albania where you can rent a car for few days to get around the city. The car rental services are offered at affordable rates and pricing depends on factors like the make of the car and how long you intend to hire the car. Other car rental services can also be found online through the respective car rental websites. The Albanian cuisine is arguably one of the best you will come across in the Europe. It is a blend of the Italian, Greek and Turkish cuisine. The main dish is known asgjellÃ« and is always served with salads, mostly during lunchtimes which is Albanians main meal. In other areas especially along the coast and lakes, seafood is very common but still, you will not fail to notice the famous gjellÃ«. It’s almost like the Americans and pizza. If you are visiting Albania for the first time, be sure of having your way around and enjoying you holiday or vacation. 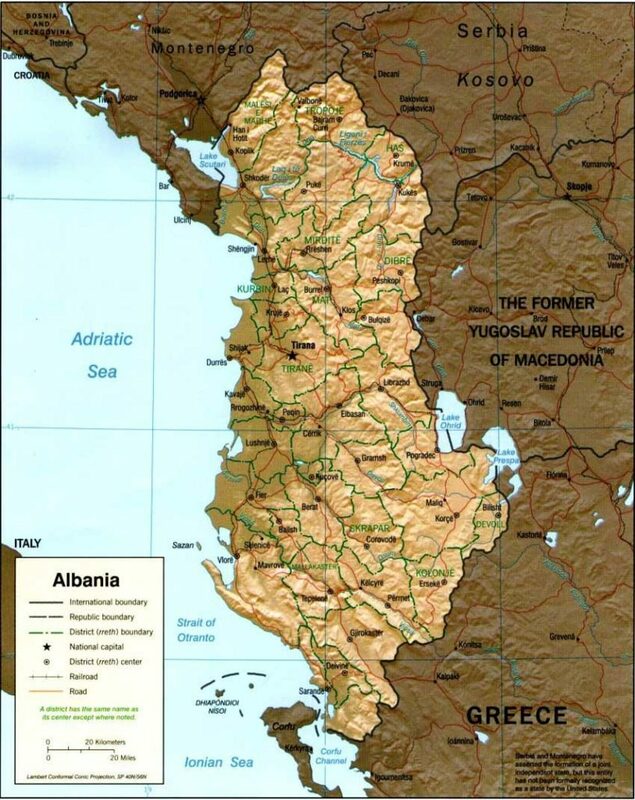 Travel Albania and have fun as the map of Albania is easy to follow. The Albanian people are friendly and will help you find your way around Albania should you get lost. With a population of over 800,000, Tirana, the Albanian capital city is an easy to go through city. Here you will find good hotels and people who speak good English, something that spices up you entire vacation in Albania.